In which Arcoscephale remains the only nation to be completely defeated. 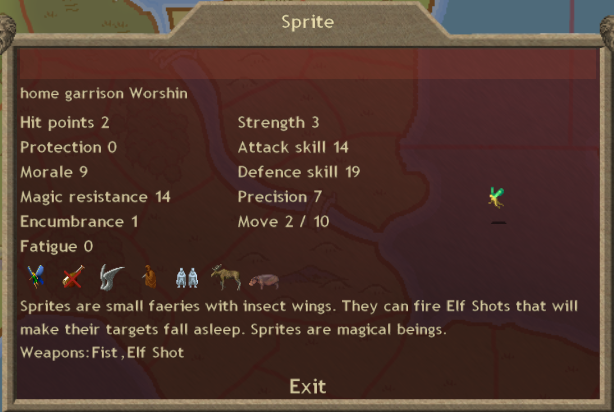 I did not realize this until just now but the spell is, uh, spelled "Faerie" while the unit is spelled "Faery." There's also a Nature teleportation spell called "Faery Trod" which I guess means that the spell I just cast is the odd one out and probably should be renamed by an overzealous modder or something. Anyway this spell cost me 40 nature gems but now I have a second Air caster, a healer, and another chaff summoner all in one! 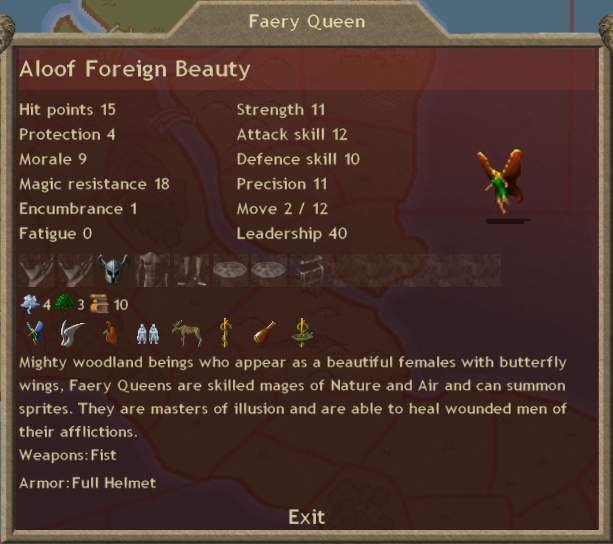 The Faery Queen can summon additional Sprites if she chooses to spend a turn doing so. Mostly I summoned her because I am so terribly hard up for Air casters and the one Illusionist that I wrangled from builds character's territory died of old age and the other one I got as a hero died from being ordered around by Dawkish. That brings me to the one site I found this turn. This is Dural Woods. As has been discussed, the yellow lines coming out of it show me all the connections to other provinces (in other words, which provinces are adjacent and can be moved into with 1 map move). See the fort just to the northwest of Dural Woods? That's my capital (yes, I realize I've been using the spelling for buildings and not regions or cities, no I'm probably not going to go back to every other post I've made to correct it). This site was hiding adjacent to my home province the entire time. How did I not know about this? Why didn't I find it until now? I've made a post about this earlier, but it's because I am too lazy to manually select which province my remote site search spells target. I just hit the key to cast a spell monthly and let the game figure out where to cast it. 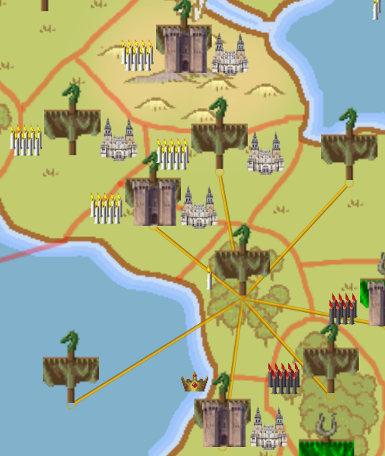 The game's algorithm for where to cast remote site searches does not have anything to do with proximity to one's capital. Some other stuff happened, too! I captured that fortress from Lanka without a real fight. He had three of his ape priests in there and I had a Enarie and 5 hydra hatchlings. I would screenshot it but there weren't any particularly interesting shots and really it's not even worth putting in a Lanka section. Finally there was the Arena Deathmatch. Both builds character and I forgot to mention that an Arena Deathmatch was scheduled in turn 65. 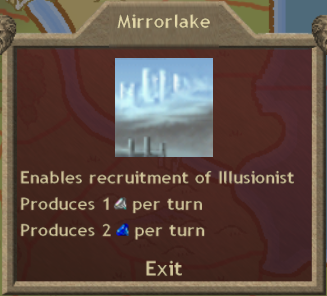 This is a random event that occurs for everybody in the game at the same time. On the turn that the deathmatch is announced, each player can select a single commander and give him the order to "Compete in Deathmatch". The game then randomly matches up all of the commanders with those orders and has them fight one another in one on one battles similar to assassin attempts. Retreats are treated as deaths and all deaths are final. As it turned out, I was the only one who sent anybody because I am the only one here truly committed to showing you folks everything there is to see in this game. My contender won the Deathmatch without any competition. 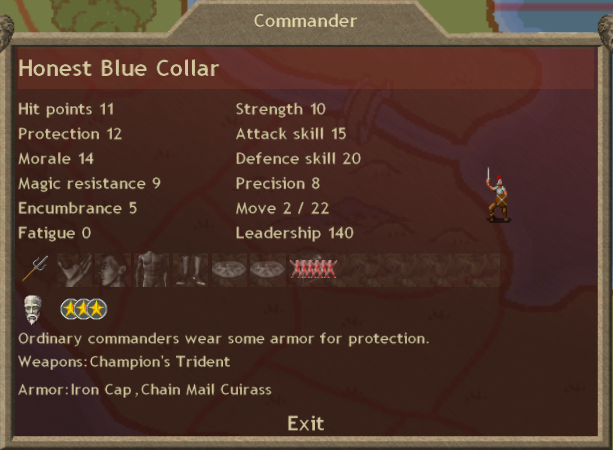 However, because I am not a complete idiot I only sent a generic independent commander with Old Age who wasn't really doing anything but shuttling blood slaves (obviously he wasn't shuttling any blood slaves when I sent him to the Arena). Here is a screenshot of him back on his original job but carrying his new prize. 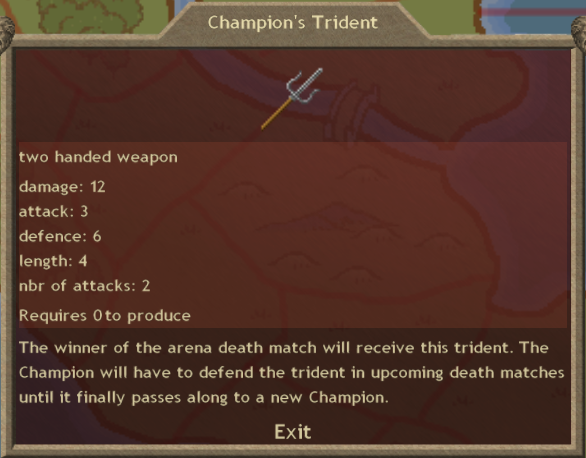 The reward for winning the Deathmatch is a horrible 2-handed trident that you can't drop and which automatically makes its wielder fight in any future Deathmatches. As you can imagine, risking death for a cursed weapon is not something that most players want to send any commander off to do, much less any valuable one. However, I am willing to suffer for your amusement, so here's a shot of the weapon as well. Here's a map of the entire world. I didn't crop it down to just the strip that concerns me. However because that image is a bit wider I put it in a thumbnail. Most notably, Lanka is down to just his capital province now, ad T'ien Ch'i is still under siege. Good job sealing the deal, builds character!